Unless you’ve been living under a rock for the past year, you know the McLaren 720S is an absolute animal at the drag strip. The supercar from Woking is virtually unbeatable when it duels other high-powered machines in stock form, and in this video, we can see it claiming yet another victim. It’s a Lamborghini Aventador, but not the original LP 700-4 launched many moons ago. Instead, the drag race organizers managed to get a hold of a shiny new Superveloce Jota – the meanest raging bull of them all. Doing a quick comparison of the specs sheet might tempt some people into believing the McLaren doesn’t stand a chance against the Lamborghini. The former “only” has a V8 with 710 horsepower whereas the latter is powered by a mighty V12 with an extra 50 hp for a grand total of 760 hp. However, it would be wrong to judge the performances of these two cars solely by looking at their horsepower figures. Take for example the amount of torque generated by the two engines. The 720S has 770 Newton-meters (568 pound-feet) at 5,500 rpm thanks to forced induction compared to the SVJ’s 720 Nm (531 lb-ft) available considerably later in the rpm range, at 6,750 rpm. There’s also the matter of the gearbox, with the Aventador still stuck with the single-clutch seven-speed ISR that’s been around for ages as opposed to the much newer seven-speed dual-clutch of the McLaren that has proven to be so fast that a data logger can’t keep up. Also worth mentioning is the Jota has an all-wheel-drive layout whereas the 720S comes in RWD form. Weight is also an important factor in a drag race, and the big Lambo is not exactly a light car. The SVJ tips the scales at 1,525 kilograms (3,362 pounds) or 252 kg (555 lbs) more than the McLaren, with both figures representing the dry weight of the supercars. Even though both are categorized as supercars, there are some major differences between the 720S and SVJ, differences which are reflected in the outcome of both drag races. 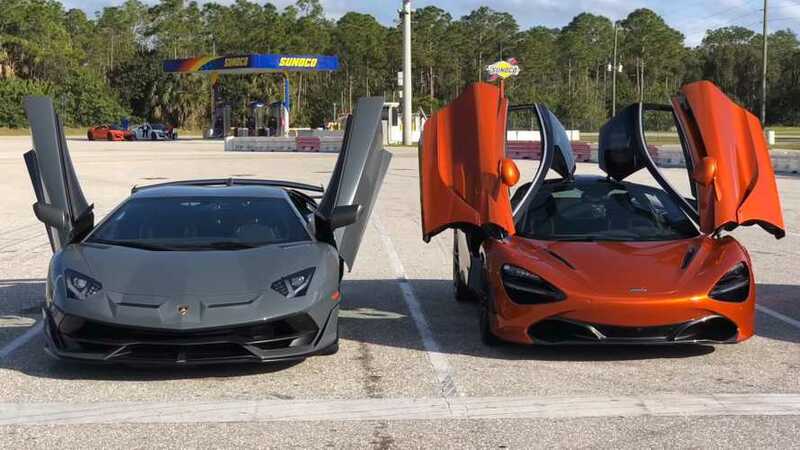 Simply put, the Lamborghini didn’t stand a chance, and that makes the 720S even more impressive when you look at the massive price gap between the two of roughly $230,000. The cars may have been built for different purposes, with the SVJ engineered with a focus on track use, but that won’t matter for those purely looking to be the best at the drag strip.